Explore the entire Comme des Garçons Play collection on our site. Série Noire selects different t-shirts, polos, shirts, sweaters and pullovers for you in different colors each season. Each piece bears the iconic heart logo, designed by New York artist Filip Pagowski. The flagship piece of the collection is the Converse All Star Chuck Taylor sneaker, a collaboration that started in 2009. Launched in 2003, Comme des Garçons Play is the second line, or "diffusion line" of the Comme des Garçons label created in 1973 by Japanese designer Rei Kawakubo. Play is a line of urban and unisex garments, inspired by classics of men's and women's dressing. COMME DES GARCONS PLAY x Converse off-white canvas Chuck Taylor 1970's hi-top sneakers printed at quarter panel with signature red playful multi hearts. COMME DES GARCONS PLAY x Converse off-white canvas Chuck Taylor 1970's low-top sneakers printed at quarter panel with signature red playful multi hearts. COMME DES GARCONS PLAY x Converse khaki canvas Chuck Taylor 1970's low-top sneakers printed at quarter panel with signature red playful multi hearts. COMME DES GARCONS PLAY x Converse Off-white canvas Chuck Taylor 1970's high-top sneakers printed at quarter panel with oversized signature red playful heart. COMME DES GARCONS PLAY x Converse men's off-white canvas Chuck Taylor 1970's low-top sneakers printed at quarter panel with oversized signature red playful heart. 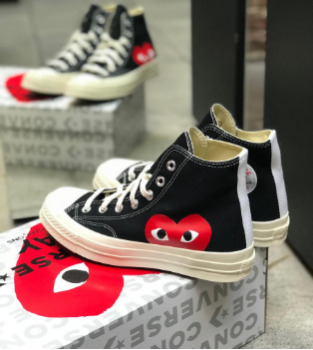 COMME DES GARCONS PLAY x Converse men's black canvas Chuck Taylor 1970's low-top sneakers printed at quarter panel with oversized signature red playful heart. COMME DES GARCONS PLAY long sleeves white tee made in cotton with red heart and logo printed on sleeves. COMME DES GARCONS PLAY long sleeves white tee made in cotton with three red hearts and logo printed on sleeves. COMME DES GARCONS PLAY long sleeves white tee made in cotton with five red hearts and logo printed on sleeves. COMME DES GARCONS PLAY long sleeves white tee made in cotton with a red heart embroidered on chest. COMME DES GARCONS PLAY long sleeves black tee made in cotton with a red heart embroidered on chest. Register to our newsletter and get 10% off on your first order.